March 20, 2019, 2:02 p.m.
By Joshua Benton @jbenton March 20, 2019, 2:02 p.m.
What should news organizations do when an enormous cache of newsworthy information suddenly becomes available to reporters? In an earlier era, you might have expected newspapers, broadcast outlets, and anyone else with an audience to battle for scoops, trying to get the exclusive angle or the blockbuster document that would sell papers or lead the 11 o’clock news. But today, frankly, not many outlets have the resources — or the economic incentives — to play that game. In a leaner time, the right move might be working together instead of fierce competition. That’s what’s happening in California, where more than 30 news organizations have decided to work together on one of the state’s biggest opportunities for good journalism: the widespread release of police misconduct records. A bill signed into law last fall, SB 1421, overrode decades of precedent that had made it very difficult to access internal investigations or other evidence of wrongdoing by police. The new law took effect on January 1. But while the law made those records available, it is still up to journalists (or other interested parties) to make the record requests, to respond to objections raised by police unions, and to try to tell both individual stories of misconduct and the larger narrative of what we can now know about policing in California. In a state of 40 million people, more than 600 law enforcement agencies, and about 120,000 sworn officers and civilian law-enforcement employees, that’s a tall order. The scale of the challenge is what has led more than 30 news organizations to work together as the California Reporting Project. Instead of local papers getting only a limited window into their immediate area — and larger organizations duplicating their work in search of a statewide perspective — publishers and broadcasters big and small would coordinate their work, share their findings, and inform each others’ reporting. If it sounds unusual — it is. The idea started with a call from @kqed late last year (yo @SFNewsReporter and @Ethan_Lindsey) and grew from there as we realized we had a real opportunity to serve the public by working together. They began reaching out to other types of news organizations: big newspapers (Los Angeles Times, San Francisco Chronicle, Orange County Register), smaller papers (Chico Enterprise-Record, Eureka Times-Standard, Lake County Record-Bee), nonprofit news sites (CALmatters, Voice of San Diego), smaller public radio stations (KVPR in Clovis, KCBX in San Luis Obispo), and even educators (Investigative Studios, a nonprofit affiliated with UC Berkeley’s Investigative Reporting Program). “Knowing there was this real sea change coming when it came to access to these records, California journalists started to think about what it would take to actually acquire those documents and then report on what they told us about patterns in police behavior,” Garvey wrote. The collaborative has 33 media outlets that usually compete fiercely for stories. Now they are working together on this issue of vital public interest to examine shootings, other significant force by police officers as well as dishonesty and sexual assault by on-duty cops. The stories also highlight the various ways agencies seem to be delaying or avoiding the release of records, including an “IT crisis” and a “dangerous storage container.” (“The boxes are stacked in such a manner causing it to be dangerous for an employee to enter,” a police chief wrote.) Other police departments chose to burn or shred old police records before the law took effect on January 1. “Our hope as publishers, editors, and reporters is that this unprecedented cooperation between 33 of California’s newsrooms will shine a light on police misconduct and use of force,” wrote Voice of Orange County’s Norberto Santana Jr. The small nonprofit site was able to collaborate with lawyers from the L.A. Times and KPCC to stop a police union from sealing misconduct records. “To be clear, if Voice of OC and our media partners had not taken legal action, your rights to see raw documents and truly hold law enforcement accountable would have been severely restricted,” Santana wrote. Collaborations that would have been unthinkable 30 years ago have become a relatively common strategy for newsrooms — particularly on stories with large geographic reach or centered around a large collection of documents. The Panama Papers and Paradise Papers are global examples, where the reporting crossed country boundaries as easily as the offshore money they covered. Local and regional partnerships — see Philadelphia, Detroit, and most recently Charlotte — have also caught on as a way to divvy up reporting and to tell stories across multiple types of media. There are also a number of precedents in California. Both the Center for Investigative Reporting and CALmatters have worked with many of the state’s news organizations over the years. The California Civic Data Coalition has worked for years to clean, crunch, and share public datasets across news organizations. And more than a decade ago, two dozen news outlets and journalism organizations worked together on the Chauncey Bailey Project to investigate the murder of its namesake, the editor of the Oakland Post. As for this California coalition, its members have filed more than 1,100 records requests with more than 600 police agencies — so far. 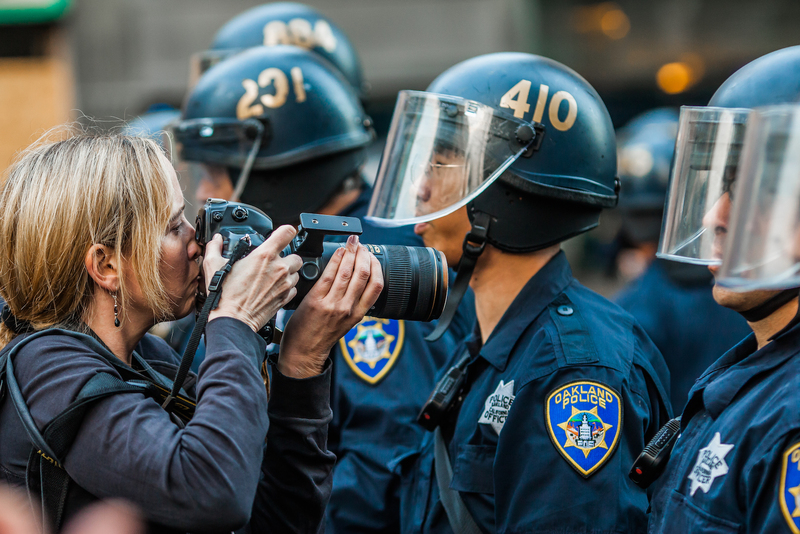 Photo of a photographer and an Oakland police officer July 8, 2010 — the day that the police officer who shot Oscar Grant was found guilty of involuntary manslaughter but not guilty of murder or voluntary manslaughter — by Thomas Hawk used under a Creative Commons license. POSTED March 20, 2019, 2:02 p.m.
Benton, Joshua. "With vast records of police misconduct now public, California news outlets are collaborating instead of competing." Nieman Journalism Lab. Nieman Foundation for Journalism at Harvard, 20 Mar. 2019. Web. 24 Apr. 2019. Benton, Joshua. "With vast records of police misconduct now public, California news outlets are collaborating instead of competing." Nieman Journalism Lab. Last modified March 20, 2019. Accessed April 24, 2019. https://www.niemanlab.org/2019/03/with-vast-records-of-police-misconduct-now-public-california-news-outlets-are-collaborating-instead-of-competing/.